Inventory We are a resale marketplace, not a box office or venue. Ticket prices may exceed face value. This site is not owned by Westbury Theatre . 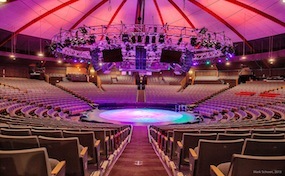 The NYCB Theater at Westbury (originally known as the Westbury Music Fair) is an entertainment venue located in Westbury, New York constructed in theater in the round style with seating for 3,000 that was originally developed as a means to present top performers and productions of popular theatrical musicals at a series of venues located in suburban locations on the East Coast of the United States. The Westbury Theatre is one of the premier venues for the New York City area. Some of the greatest performers and comedians have performed here in the past and the future will be no different. Westbury-Theatre.com is not a primary vendor, supplier, or affiliated with any official website or Michigan State University. We proudly provide access to a large supply and low prices online for all secondary market events. Ticket prices may be well below or above face value and will fluctuate with the market. To purchase tickets for all Westbury Theatre, New York events simply click on the show of interest or call our operators at anytime.